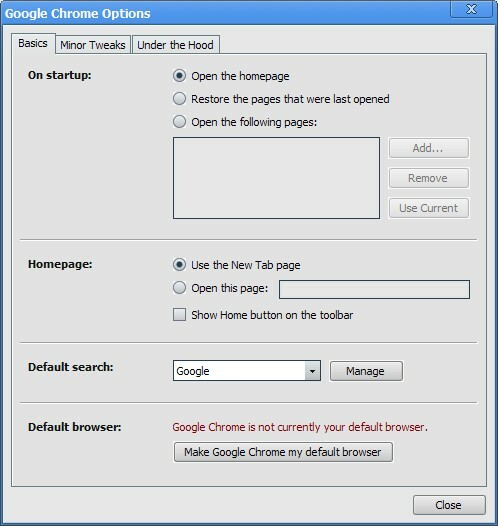 So who would have thought Google would launch a web browser? Just about everyone, and the puzzle is why it took so long. 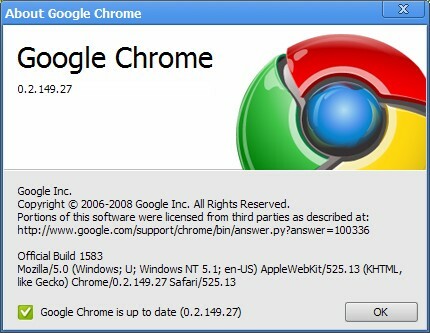 Now that Google’s Chrome is here I took a few minutes to reboot and have a play. It’s a Windows only experience for now, with the promise of Mac and Linux versions to follow. 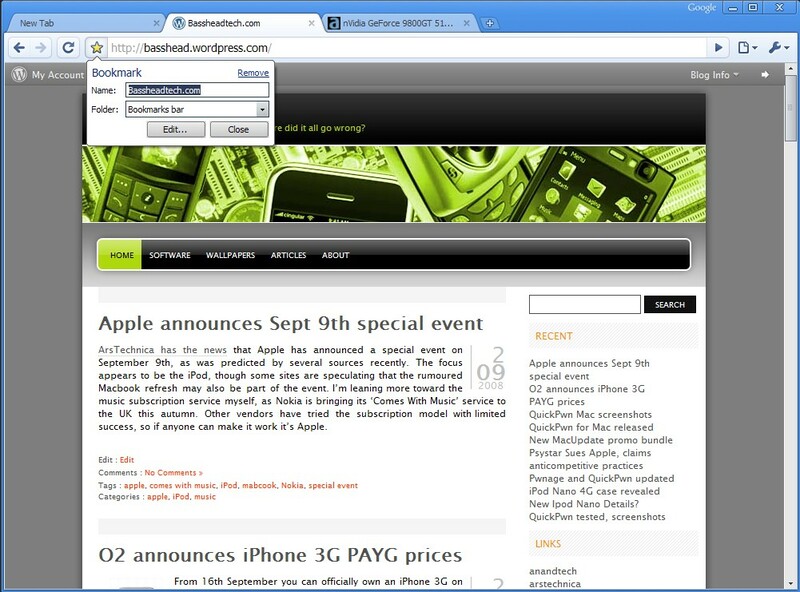 Nothing exciting to see in the About box, and parts of Firefox and Apple’s WebKit are used in Chrome. On to the main interface, and the first thing that stands out is the position of the tab bar, at the top. Having the tab bar on top is a little unusual since I’m used to Firefox, but it doesn’t look out of place here. 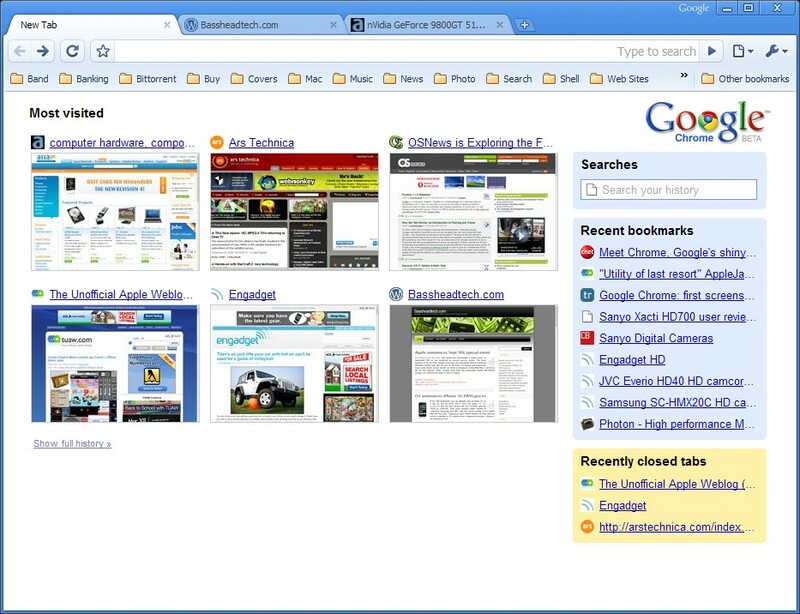 Adding and closing tabs is a familiar task, and they can be dragged around as expected from a modern browser. 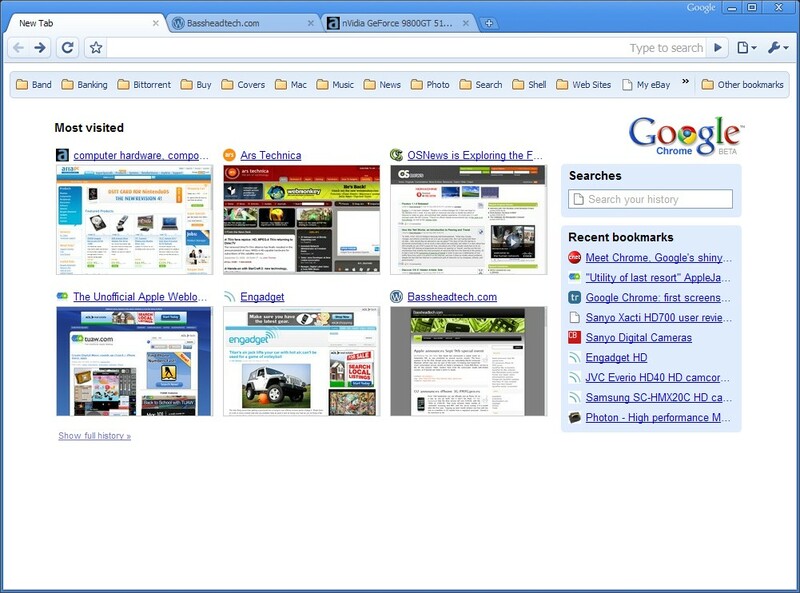 The screenshot above shows the default home page, with thumbnails of recently visited pages and bookmarks. The layout is easy to follow and a useful place to start browsing. There isn’t a menu bar, but the document and spanner icons to the right of the address bar provide all the options you need. 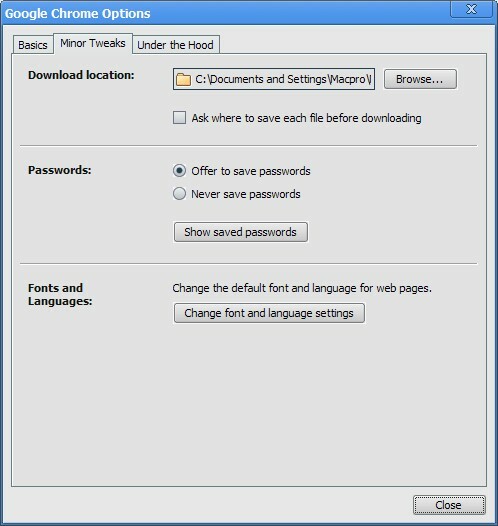 The document icon displays a menu for the current page, as well as new tab options. 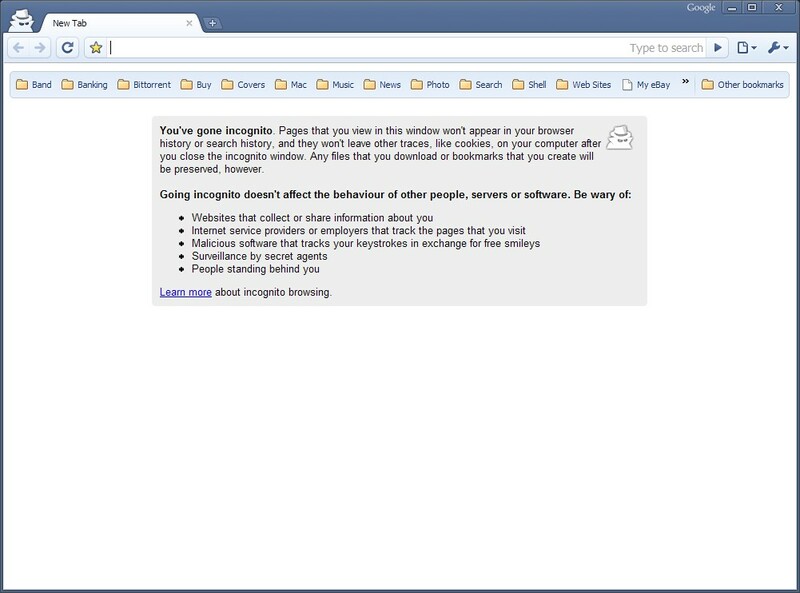 ‘New Incognito Window’ is a private browsing mode, more on that later. The spanner shows the Chrome menu, with access to options and some common functions. ‘Always show the bookmarks bar’ has an unexpected effect. Un-ticking this option detaches the bookmar bar from the browser and shows it as part of the home page, so it’s lost when you navigate to another page. Clicking the star next to the address bar brings up an add bookmark box, similar to Firefox. Where one click add the bookmark to the unsorted folder in Firefox, in Chrome it just brings up the bookmark add box. This in incognito mode, where your browsing activities will not be recorded by the browser. Similar to Safari’s private browsing option, this does nothing to hide your activities from the sites you visit, there just won’t be a record on the computer. Unlike Safari it’s not a universal on/off option, and you can have a regular windows and an Incognito window open at the same time. The Menu bar is darker in the Incognito window and the icon in the top left corner appears, so it’s easy to see which window is private. One area where Chrome is a bit lacking at the moment, at least for those who want to customise their browsing experience, is in the options. The Basic tab above has what I would expect. Minor Tweaks has a few more basic settings, but my dissapointment here was that I couldn’t find an option to set a minimum font size. 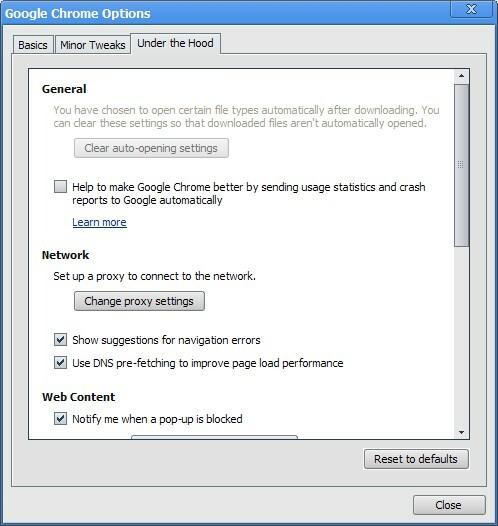 I usually set this to 13 on any browser I use, but Chrome only has an option for selecting which fornt it should use where none are specified. In other Chrome related news, it didn’t take very long for the exploits and security flaws to start showing up. Much like any other browser Chrome will be found to contain flaws, which is inevitible with any complex piece of software. The real battle starts now, with new versions of Firefox, Internet Explorer and Safari due. Good news for users, as all this competition means more choice and faster progress. IE is going to offer users a chance to set IE to “private”, which will block Google’s Adwords advertising then Google Chrome born. Google Chrome is clean and fast. But I love Firefox.